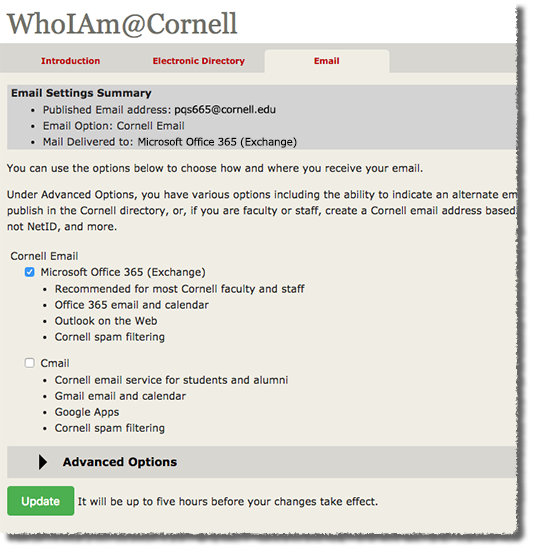 Graduates and professional students with Office 365 accounts set their routing on Cornell's Who I Am webpage. You'll need to log in with your Cornell NetID and your password. You'll see the Email tab of Cornell's Who I Am page. Under Cornell Email, select Microsoft Office 365 (Exchange). You can now read and send messages in Outlook on the Web and/or by using whatever email client you prefer. See our Choose Which Email/Calendar App to Use article for details on configuring a client. Again, before you decide to forward your Cornell email to a non-Cornell account, please be aware of policy changes by the major email service providers that may affect your email delivery. The current best recommendation for everyone with Cornell email is to use their cornell.edu account to send and receive mail.